I Love Yellow Wax Beans! This is the first year I've planted yellow wax beans in the garden. It was purely by accident. I went to the feed store to get green beans, and, well; one should always have their glasses on when shopping. That's all I'm sayin. By the time I realized my mistake, they were sprouting. So I let them go. I have yet to can any. Not because we aren't getting them coming in, but because we have discovered roasted beans. The clouds parted and the angels were singing! It takes a lot of beans to roast, and you will eat every one I promise. Just toss them with a little olive oil and salt and pepper. Preheat your oven to 450. Spread them out even on a cookie sheet. Bake in the 450 degree oven for 15 minutes. Toss once about half way through the time. Enjoy! I always knew about roasted potatoes. Who doesn't. Then I learned about roasted carrots. Now roasted beans. I'm thinking this roasting thing is going to be my new go to. I still need to can beans for winter, but I think I'm gonna keep them whole and try roasting them from the jar. It's an experiment in the making. The squash is covering me up. I have grated Zucchini, and sauteed Zucchini and put them in the freezer. I've made Zucchini relish. I've also sauteed yellow squash for the freezer. We've had it for dinner multiple times as well. In fact I will cook some for just myself some lunches. I still have it coming in. So far I have about 4.5 lbs of blueberries which is more than I thought I would get. The blackberries are coming in as well. All in all, I'm very pleased with the results. I have to say I like the "Back to Eden" garden. I know it isn't at it's full potential this year, but it has seriously cut down on the amount of maintenance needed for my garden. I can't wait to get all I want covered in wood chips done. So do you have a garden this year? How's it going? Share your stories or pics! I would love to see them! My latest book read is "Folks this ain't Normal" by Joel Salatin; owner of Polyface farms in Virginia. Highly recommend this book. He's a big proponent of not just local eating, but scratch cooking, old skills, hard work etc. Anyway, he got me to thinking and so I started looking around for local sources as well as organic, free range, pastured sources for food. Here is what I know. I can't do it all. 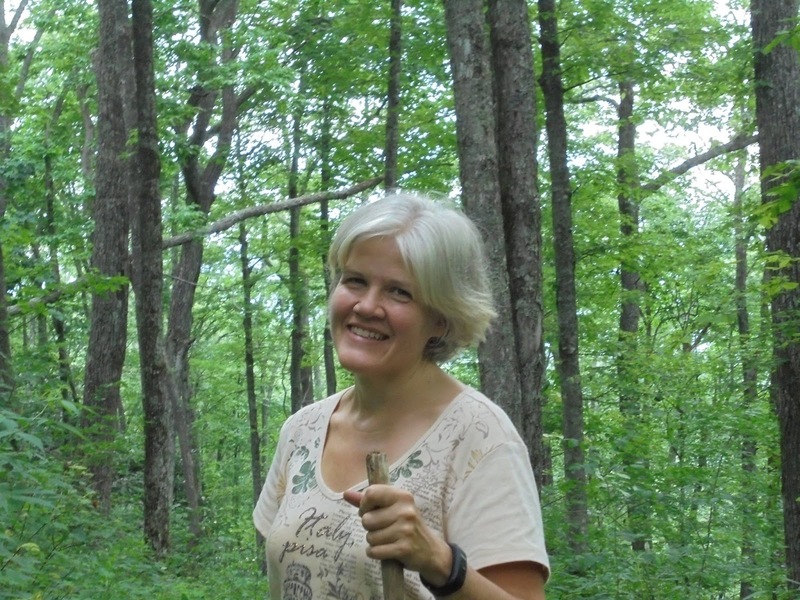 So if I am going to be able to buy truly local and organic foods I will need to grow most of it. Next on my list is raising pastured chicken cause that is out of my range too, but I digress. As a result of my new found determination to grow as much of my produce as I can, My garden is slated to be in over drive for the season. I'm fortunate that we have a long growing season. Our first frost usually isn't until Oct 21st and we normally don't get brutally cold (teens and twenties) until Jan. This give me extra time for cold weather crops to come in. Currently there is no more room in my garden for anything else, but as things play out and are pulled out, I will be replacing them with something else. Squash- The first to go. I currently have 9 squash plants growing. These were all planted a few weeks behind each other. The first set of three is about done. They will be pulled out and some volunteer lima beans will take their place. The volunteers are currently growing next to my decks bottom step. Green beans( bush) will more than likely replace the other squash plants. Corn- The corn is going gang busters! Once these beds are done, I'll plant more green beans. Corn is a heavy feeder and so before I plant the beans, my plan is to mix in more compost and let the beds sit a few weeks. I will plant these beans about August 1st. Beans take nitrogen out of the air and put it into the ground through their roots. It will continue to replenish the soil. Cherry tomatoes_ despite my no volunteer pledge, I finally got to the point where I had to let some stay. The are relegated to one main branch, however. As these die back, the plants will be pulled out and maybe snow peas will be added. The cherry tomatoes will be dehydrated (I hope). Roma tomatoes- Once they die back they're done. I'm not gonna try to let them keep going. I'll replace them with snow peas if possible. When my slicing tomatoes die back, they will be allow to stay. When it cools off, they will come back and make the prettiest tomatoes. 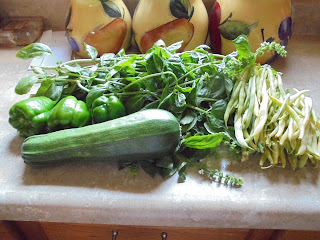 These I will pick green and can fried green tomatoes for the pantry. How cool will it be to have a garden last until Dec or Jan? AWESOME! The Garden is in full swing now. Things are starting to bloom and I'm finally getting some squash. Not sure if the "romance" worked or if my problem was one of a pest causing the squash to not produce. I went to an area farmers market and, while there, talked to a very nice farmer who recommended I remove all of the babies and spray with an organic spray. Desperate to try anything, I went home and did just that. Well I did almost that. I removed all of the affected babies; those that were no longer viable. So not sure if the assisted romance worked or if his idea worked, but something did and for that I am thankful. You want something good to eat? Melt a little butter and chop up a yellow squash and some onion. Saute it all in the butter with a little salt and pepper until the onions are kinda caramelized and the squash is soft. Oh YUM! This is one of my favorite beds. I have no idea why I took this picture without putting that flat cinder block back in place, but it is what it is so just disregard that and feast your eyes on the pretty plants! Tomatoes are all along the back. Then from left to right we have Parsley, Marigolds, Basil, Bell Peppers, More Marigolds, More Basil, More Bell Pepper, and last but not least, More parsley. By the Way, far left you see something growing out of the cinder block. That isn't a weed. It's Marigolds. I let them stay where they landed and they are thriving. Go figure. Enough water to make a gallon. I start with putting everything but the water and soap in a 2 quart jar and adding just enough warm water cover it all. Then Pulse it in my blender. I let it sit over night "steeping". In the morning I strain out the "stuff", leaving the liquid. Add the rest of the water to make a gallon and the TBS of soap. Put in a spray bottle and go. Spray either early in the morning or in the evening. Try not to spray in the heat of the day. This has served me well so far and is so inexpensive I don't mind having to reapply if needed after a rain storm. Hope this serves you well as well. Have a great day! BTW aren't my free wood chips so pretty! Ahem... never thought I would have ever done this, but a gardeners gotta do, what a gardeners gotta do. I have three huge yellow squash plants and two huge zucchini plants all covered with baby fruit. And I do mean covered. I should be covered up with squash coming in right now. Problem is, though they are covered with baby fruit, these fruit will grow no more unless pollinated by bees. I could not figure out for the life of me why this wasn't happening. I went out this morning to investigate. At first I thought is was a lack of bees, but I don't believe now that was the case. Something, probably bunnies (who are getting less cute by the minute) is eating the male flowers. Not cool. There were maybe two male flowers left between the two zucchini plants. So quieting the voice in my head that said "give them some privacy", I took the male flowers off, opened them up, and went around to the rest of the viable fruits (some had already started dying. Nothing to do about that.) and pollinated the fruit (female flowers) by hand. I did the same with the yellow squash. I will more than likely have to continue this for now, each day. I now have a keen knowledge of what a male flower and a female flower looks like with their petals off. I know, I know. Just feels wrong somehow. But it had to be done. 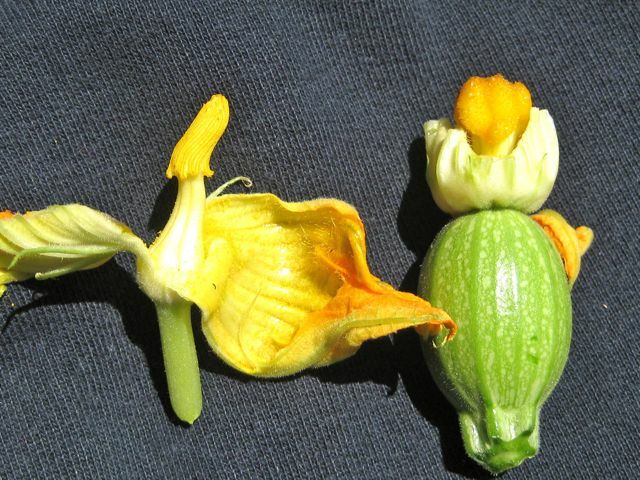 Below are the squash flowers. Left is male, right is female. See how it is attached to the fruit? On the wood chip front, I am off this morning for another load of free wood chips. The ones I have already laid down are doing great! The plants are thriving. In fact, I thought we were done with asparagus for the season, but we have more coming up now that they are protected from heat, and have plenty of moisture. We received a lot of rain these past three days and so the garden is exploding. After the plants dry some, It is back to pulling off tomato suckers, cutting herbs, and other various garden maintenance. Two totally awesome gardening tips I never knew! Well, that title sounds like I know everything. That is soooooo not the case. The old adage of "You learn something new everyday" is really true. That is if you are willing to learn. That is a sermon for another day, so ON TO THE TIPS! 1) Milk spray- Yes. That is milk like you get at the store. While walking through my garden the other day, I noticed a lot of white spots on my cucumbers. So, I went to the computer to ask why. Well it's called "Powdery Mildew" and it is prevalent among the squash family. In an effort to keep my garden as organic as possible, I looked up organic treatments for "Powdery Mildew". I found many articles on milk spray. Basically it's 1 part milk to 2 parts water. You can use any type milk you want. It's the protein in the milk that does the trick. Something about the reaction created when the sun hits the milk. It creates an environment that the fungus can't handle. I sprayed yesterday. You should spray in full sun when the leaves are dry. When I went out this morning to check on things, I noticed the spots are fading and, in some cases, disappearing. I'll spray again in 10 days or if it rains. 2) Back to Eden Gardening- In a nut shell, deep mulch gardening. Here is a link for the info. It's kind of lengthy, as it's a documentary, but I watched the whole thing. Very informative. *** check with your local landfill or tree service to obtain wood chips. I should have some being delivered this week or next by a tree service, but I also took my little truck to our landfill and they had wood chips for days. They filled my little truck to the tippy top of the bed. The last two days I have been putting wood chips in my garden beds, flower pots, window boxes, etc. Here's my garden so far with the chips added. I need more chips to cover the last four beds and plan to put chips in between my beds as well which will get rid of the rock walkway. Long ago I began the process of moving our family to a healthier way of eating. It all started with Rubic being diagnosed with multiple allergies, both environmental and food, but primarily corn. Corn especially in the form of High Fructose corn syrup. That stuff could set him off in hives faster than anything. In my enthusiasm to help my son I spent all of our grocery money at a health food store, and received very little food as a result. It was just too expensive. So I then thought I would just have to read labels to get all the allergens out of his diet. This also began my foray into ultimate scratch baking. Anyway, It was while reading labels and baking something that made me about give up. Corn is in baking powder. I know right! I didn't give up entirely, but I did have to moderate my expectations some. HFCS was the main culprit. I had to make sure that was out, but the other stuff I just had to do the best I could. Money was tight. Whole corn products seemed to have less effect on him, so HFCS was my primary focus. 15 years later, I'm still not where I can do everything I would like, but I have made progress and feel we are in a better place now. Eating organic has become "all the rage", and so you really need to be able to get the most bang for your buck if you're going to try it. While his allergies opened my eyes to better eating options, It's been a work in progress. Changes have been made in steps rather than all at once, and that is my first point. 1) Small changes over time- Ours started with trying to remove High Fructose Corn Syrup out of our diet. I wasn't worried about organic or all natural at the time. I was just wanting to buy items my family would eat that didn't have that stuff in it. If I could, I avoided corn in general, but primarily HFCS. Funny though, while trying to remove the HFCS, I found we were eating items on a healthier scale. If I bought boxed cereal, it was rice, wheat, or oats. Nothing sweetened because that meant HFCS. It was a minuscule change in the big scheme of things, but a change. Then I began to read about margarine and how it wasn't such a good idea. We switched to butter. I buy it when on sale and stock up (Usually around the holidays). Dh was dealing with high blood pressure and cholesterol. We switched to Extra virgin olive oil (I buy it at Sams). Both butter and Olive oil are more expensive. You can't fry with Olive oil so, guess what, we ate less fried foods. Each small step we took led to another small step we tried. 2) Make your own- In my effort to not only get HFCS out of Rubic's (and my families) life as well as save money to afford the changes I was making; I began to do a lot of scratch baking. There were items my kids liked that I wanted them to enjoy, but the store version was not a good option. It's a real eye opener once you start to read labels. Boxed cereal was replaced with homemade granola. Cookies, granola bars, bread, Chocolate syrup, etc; are now made at home. 3) Learn - This can be used multiple ways. Learn a new skill: canning, bread making, gardening, and cooking in general. Also, learn about the food you purchase and how it affects you and your family. Look up those unpronounceable ingredients. In a world of google, information is at your finger tips. As I have learned about what goes into the foods we buy, I have felt compelled to make the changes where I can. On that same note, and not to only make it look like I'm picking on processed food, Just because something says "organic", "whole grain", or "all natural", doesn't mean it's good for you. If you buy organic boxed macaroni and cheese, you are still dealing with powdered cheese, white pasta, etc. My main pet peeve right now is Kroger's "Simple Truth" chicken. You really need to watch the label. Their "simple truth" chickens are labeled "organic"or "all natural", but the labels are identical and both types are in the same bin. Both are priced higher than the other brands. The organic I can understand, but all chickens are"all natural'. Good Grief! You need to know about what what you're buying, especially if your dollars are precious and you are trying to spend wisely. Be an informed consumer. 4) Grow what you can- I have been gardening pretty much since we have lived here (bout 20 years). My garden has expanded from just a garden to a garden, fruit trees, blueberry bushes, blackberry bushes, strawberries, and herbs. When I first began gardening, I used pesticides because that's what I knew. Over the years I have made a move away from pesticides in favor of companion planting, or scheduling my planting in such a way as to mitigate the damage from pests. I've moved away from using commercial fertilizers to using compost and chicken manure. Having chickens has provided us with farm fresh eggs, and a better garden. While I don't (yet) grow everything we eat, I do grow a good chunk of it. What I have grown in the past 2 years has had no pesticides or commercial fertilizers. While I am not certified organic with a label and everything, it's good enough for us. 5) Buy local. You can call your county extension office, or just google where the nearest farmers market will be. We have several in our area. Prices tend to be the same here in Georgia as the prices are set by the Dept of agriculture. That is up to a point. If you're buying a large amount to can or freeze, many farmers can set their own price. It's worth it if you will put these items up. Also, they will tend to reduce their prices near the end of the day. You can also google local produces of honey, milk, eggs, etc. Just keep an eye out. If someone offers you eggs or veggies, or even plants, thank them very much and enjoy your prize. What they have given you is priceless. Here are the changes we have made over time. This list might help some of you in starting out. 1) No more HFCS- there are alternatives just as cheap. In fact many companies are moving away from using it now. Never assume it isn't in something. Read your labels. 2) No processed foods- Three exceptions; turkey bacon (Einstein likes it and it's cheap), powdered coffee creamer, and chips for Dh lunches. 3) Butter replaced margarine, and olive oil replaces other oils. 4) No more American Cheese- I buy Cheddar, Mozzarella, or other hard cheeses. No low fat or nonfat cheese. 5) No artificial sweeteners or anything with them in it.- we use Stevia or sugar or a mixture of both. True confessions. Once in a blue moon I still succumb to a Diet Dr Pepper. But that is more the exception than the rule. Rare, maybe 2 a ear if that, but I want to be honest. But I know it needs to be never. 6) Whole milk, and whole milk products- No more skim milk or other non fat dairy. Skim milk used to be the waste from milk processing. It is blue normally. Chalk is added to whiten it. YUCK! I can't afford organic and if I could I would opt for raw milk (Unpasteurized). That is only sold in Georgia for Ahem pet consumption(eye roll). I buy whole milk and mix half and half with water. Reduces fat and calorie content and tastes like 2%. 7) Whole wheat flour- I use mostly in baking bread in about a 4 to 1 ratio with all purpose. It's used entirely in cookies, crackers, and quick breads. 8) Farm fresh eggs- some what free range with our chicken tractor, but not totally because of predators and my garden. 9) Pesticide and chemical free fruits and veggies from the garden. If I buy organic, it has to be a price I can handle. I also don't buy organic for things where the peeling is discarded (like bananas). 1) Buy more organic meats when possible. Eventually I want to raise pastured chickens for meat. We thought about this year but there was a bird flu out break close to Georgia and we decided to wait rather than bring any new birds into our yard. Those organic whole fryers I bought a few weeks ago made the best broth and the most flavorful and tender meat. Sold me! I just can't afford the prices all the time, but when I can, I will. 2) Try and begin to use raw milk when possible. I'm hopeful when we do this, the powdered creamer can go. 3) Master the art of bread making where no white flour is used. The idea is to start where you are making small changes as you can, and adding new changes when you can. It's taken many years to get to this point in my grocery buying, and I still have things to change. You can make the changes too. A little along.